Photo courtesy of the Long Beach Police Department. Long Beach detectives have released surveillance video of a suspect vehicle connected to the fatal shooting of a Compton man at a Long Beach Denny’s parking lot last year. The incident happened in the early hours of Sunday, March 23, 2014, officials said. Police responded to a shot fired call at 2:55AM, outside a Denny’s restaurant located on the corner of Sixth Street and Long Beach Boulevard, according to the Long Beach Police Department (LBPD). Arriving officers discovered four men with gunshot wounds, including Compton resident Charles Bell, 33, who was struck in the torso by gunfire. Bell was lying in the parking lot and determined dead at the scene, officials said. Paramedics transported the three other victims to local hospitals, where they survived their injuries. Investigators believe the suspect—described as a black man in his mid-20s—tried to instigate a fight with the individuals who were leaving the restaurant, and it escalated to a shooting. The suspect fled with multiple people in a dark-colored SUV, authorities stated, and he remains outstanding. 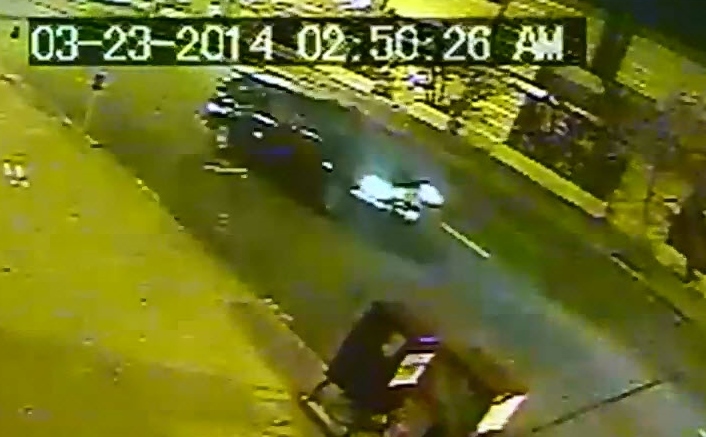 The footage shows the suspect’s vehicle fleeing westbound on Sixth Street—the wrong way on a one-way street. In October 2015 the Los Angeles County Board of Supervisors, at the recommendation of Supervisor Don Knabe, issued a $10,000 reward for information leading to the arrest and conviction of the person or persons responsible for the murder. “Detectives are hopeful the reward may prompt reluctant witnesses to come forward and provide additional information,” LBPD officials stated. The investigation remains ongoing. Anyone with information regarding the murder is urged to contact Long Beach Police Homicide Detectives S. Lasch and D. Goodman at 562.570.7244. Anyone wishing to remain anonymous may call 1.800.222.TIPS (8477), or text TIPLA plus your tip to 274637 (CRIMES), or visit www.LACrimeStoppers.org. Authorities have released surveillance footage of a suspect vehicle connected to the fatal shooting of a Compton man at a Long Beach Denny's parking lot last year.Read more: http://lbpo.st/1UBrQ0qVideo courtesy of the Long Beach Police Department (CA).